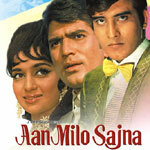 "Aan Milo Sajna" is a 1971 hindi film which has Rajesh Khanna, Asha Parekh, Vinod Khanna, Nirupa Roy, Rajendra Nath, Jr Mehmood, Tarun Bose, Sujit Kumar, Indrani Mukherjee, Abhi Bhattacharya, Aruna Irani, Sunder, Indu Shivraj, David, Dulari, Chaman Puri, Birbal, KESHAV, Mumtaz Begum, Rashid Khan and Shobha in lead roles. We have 6 songs lyrics and 6 video songs of Aan Milo Sajna. Laxmikant and Pyarelal have composed its music. Lata Mangeshkar, Asha Bhosle, Mohammad Rafi and Kishore Kumar have sung these songs while Anand Bakshi has penned its lyrics.